The Colombian gaming regulator Coljuegos announced on or close to Sept. 14 that it has increased the number of names on its blacklist of unlicensed, offshore gambling sites to 1,805. 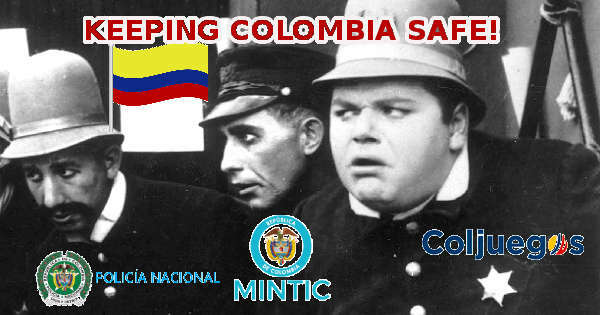 Colombian residents are being blocked from accessing these platforms thanks to cooperation between Coljuegos, the Ministry of IT and Communications (MinTIC), and the National Police (Policía Nacional). Since March 2017, Coljuegos has been maintaining a list of online gaming websites that aren't licensed to do business in the country. The initial blacklist consisted of some 300 sites, more or less, but procedures for blocking them were largely ineffective. 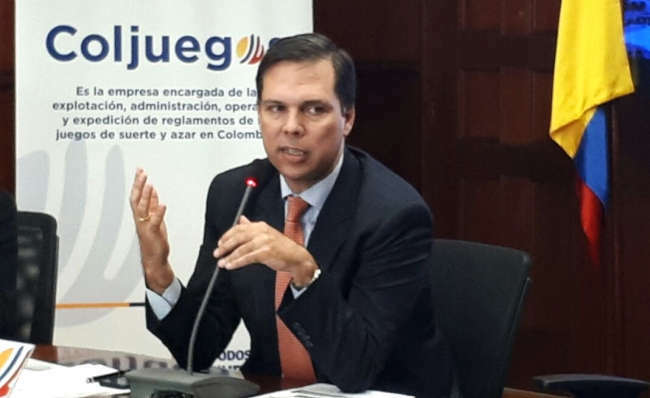 In the time from then till now, however, Coljuegos has instituted new mechanisms for effectively blockading these operators from functioning in the Colombian market. The regulatory body now works with the National Police to perform daily monitoring of those websites that advertise gambling services. If a given domain is authorized by law to offer betting, then all is well. 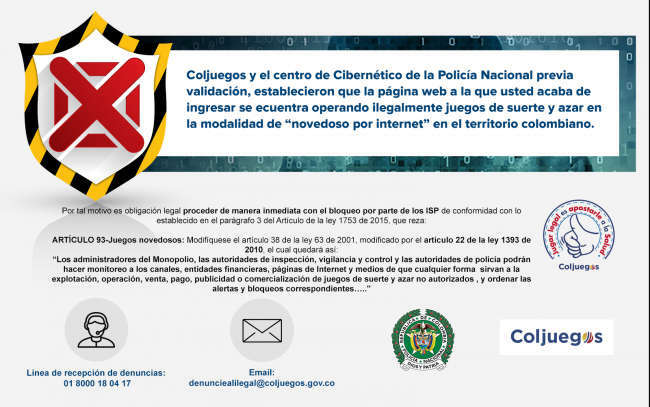 If not, then a screenshot of the webpage is taken and forwarded to the Police Cyber Center (Centro Cibernético Policial). Finally, sites in violation are placed on a list maintained by MinTIC, and ISPs are ordered to block them. It would seem that the prohibition extends beyond mere gambling outlets to also encompass financial firms that are known to transact with betting entities. Responding to a video posted on YouTube by Coljuegos, commenter Renato Mateo Cuéllar Álvarez said that the website of popular e-wallet Skrill is also being embargoed in Colombia. When it passed an online gambling licensing law in late 2016, Colombia became the first country in South America with a regulated internet gaming market. However, this was mostly a theoretical development because no organizations were licensed under the terms of this legislation. In March 2017, Colombia first instituted its blacklist of illegal betting websites. In our coverage of the story, we speculated that the government was trying to clear out the competition before state-supervised gambling arrived on the scene. Although our suspicions about the blacklist being basically a revenue-generating device appear to be fully borne out by events in Colombia, you don't need to take our word for it. Just take a look at what the President of Coljuegos, Juan B. Perez Hidalgo, had to say. “This work to control illegality has contributed to the success of the…internet betting operators authorized, to date, by Coljuegos,” he explained. Indeed, these legalized online gambling providers paid 16,593 million Colombian pesos ($5.6 million) in licensing fees and generated 21,955 million pesos ($7.4 million) in taxes during the first year of government-approved operations. Hidalgo also sounded a note of caution for those contemplating the establishment of underground Colombian internet betting houses. He warned that such activity can be punished by fines as high as 234,372,000 pesos ($79,000) and prison sentences of between six and eight years. These regulatory restrictions have hit online poker sites hard. Not only have PokerStars and Bodog ceased transacting in Colombia, but none of the 15 entities that are licensed offers poker either. This is undoubtedly a consequence of the fact that all licensed internet poker rooms had to have ring-fenced traffic. That is, Colombians would have to play only against their fellow countrymen rather than being able to match wits against individuals all around the world. Nevertheless, there was a change in the rules in late 2017 that allowed for liquidity sharing across global player pools. This paves the way for the potential return of well-known poker sites to Colombia. PokerStars in particular seems like a good candidate for licensure especially because it has kept its nose clean by attempting to comply with the law. Despite the ever-tightening squeeze that Coljuegos is endeavoring to put on offshore gaming operations, there are still plenty of them that are ready to flout its directives. It's pretty difficult to find solid information on which specific sites are being blocked at any given time and what workarounds there are. In any case, these details are likely to change rapidly as Coljuegos adds more URLs to the blacklist while gambling organizations try to set up new domains to get around the site blocking.